1) Reply to this post to save your spot in line, (DONT SKIP THIS STEP) Your post should say "I'M NEXT" or something to make it clear you're working on the image. Doing this will make sure that 2 people aren't changing it at the same time. 4) Edit your original post (from step 1) and add in the updated image! For those of us that have nothing to do on New Years, I'm hoping this will be something fun to watch. Feel free to participate several times throughout the day! Just maybe we'll end up with something cool by 2010. Last edited by Amber Alexander; December 31st, 2009 at 06:35 PM. Last edited by Randis; December 31st, 2009 at 06:14 AM. Last edited by The7Artist7; December 31st, 2009 at 08:29 AM. Cool stuff guys hopefully you'll forgive my MSpaint CURVEBALL!! I'm next, I'll clean it up a bit! Reworked it a bit so it still has the slice but uses Karma's face idea. Last edited by Amber Alexander; December 31st, 2009 at 03:46 PM. Last edited by Krato; December 31st, 2009 at 04:06 PM. 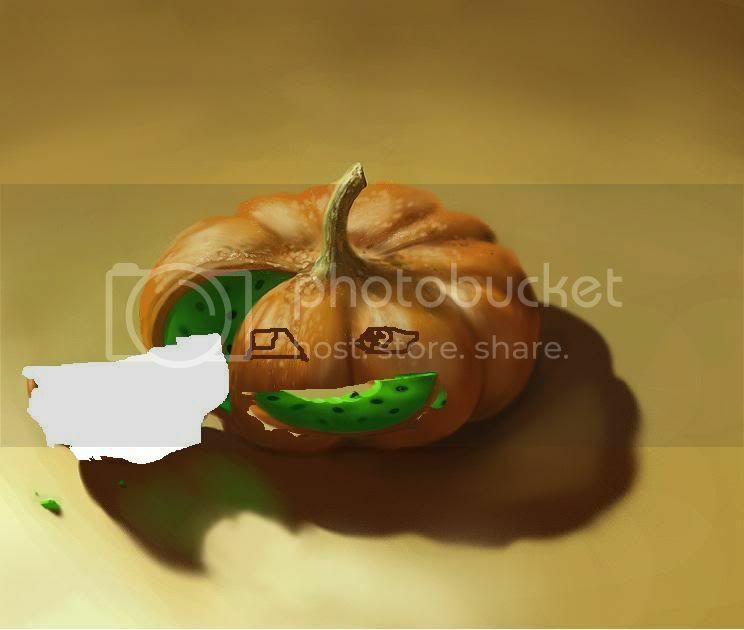 Keep the pumpkin going, all skill levels welcome!! Last edited by Amber Alexander; December 31st, 2009 at 06:31 PM. I'm next! Although I make no guarantees of quality. Last edited by Aphotic Phoenix; December 31st, 2009 at 07:16 PM. Last edited by Ian Barker; December 31st, 2009 at 08:52 PM. Last edited by Cerasela; December 31st, 2009 at 10:49 PM. yeah it is fun , this is really a cool idea Amber ! If I didn't leave my tablet at my dorm, I would totally be in on this. Awesome stuff so far! Kelly I could probably copy/paste what you did onto what's posted next so your work is included. That's perfect, whoever is going next, I believe its BlackARK, use the last one posted please He might already be working on it though. never mind its not loading. Last edited by Krato; January 1st, 2010 at 12:48 AM. this is so awesome, please make believe I said, "I'm next", haha too late, on with the show, Cerasela!!!! thanks for the improvise. I'm so happy people are having fun with this, I'll have to do more in the future! Last edited by Amber Alexander; January 1st, 2010 at 02:58 AM.